Need a Wingman? This Puff Daddy Will Do Just That @ Wingman Kitchen - Santa Ana - EAT WITH HOP! Ever needed a wingman? You know, someone to help you get that girl/guy? I have to admit, that I've been someone's wingman a few times. LOL But now there's a new kind of wingman: the Puff Daddy. Available, and Edible. Wingman Kitchen, located inside the 4th Street Market food hub in Downtown Santa Ana is known for their cluckin` good chicken sandwiches and wings. And just this past weekend, the restaurant debuted a new concept: chicken served inside a bubble waffle! I got the chance to try it too as media and am ready to tell ya how it is! In addition to the Puff Daddy, Kevin and I also ordered a bunch of other stuff like the wings and the chicken sandwich! The Puff Daddy is a new twist on the chicken and waffle combo. 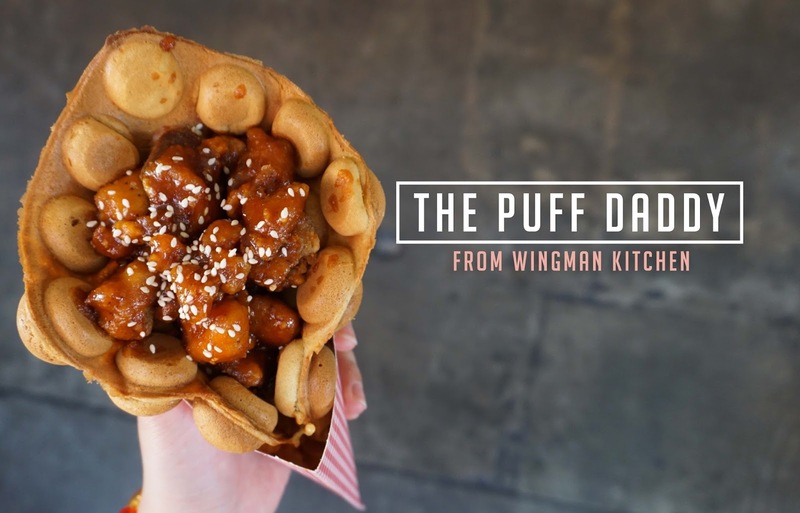 Instead of a traditional waffle, Wingman Kitchen uses a Hong Kong style bubble waffle and folds it into a cone to hold all the chicken pieces together! 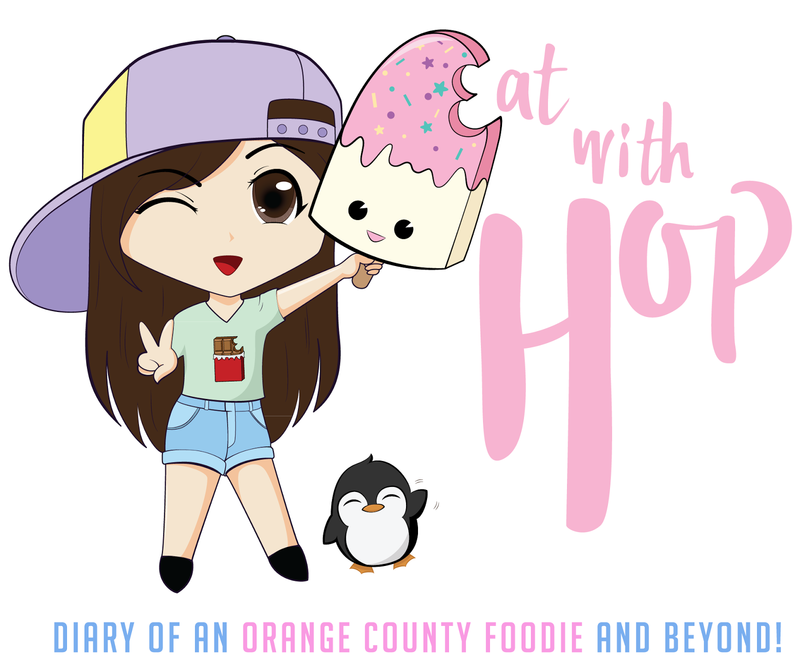 The idea itself seems like the perfect thing to eat at a festival or concert or night market because it's easy to eat and hold with your hands while walking around! If I saw something like this at a festival, I'd totally buy it! But good thing I don't need to wait for no festival... because it's available right here inside Wingman Kitchen! I think it's quite fun to eat too with all the little "bubble" puffs from the waffle, which has a slight hint of maple syrup. Something sweet. Inside each bubble is fluffy and fresh like a newly baked cake! The chicken are small chicken pieces, boneless, and reminds me of popcorn chicken (without the "pop" crispy part). I honestly think this chicken would go great with rice just because of the way it's seasoned / flavored. It's more.... Asian-flavored and because the chicken pieces are more.... wet? than crispy? I think that's why they paired it with the egg waffle, because instead of eating this with rice, it goes great paired with the waffle which is sorta like "filler" ...to balance out the flavors. Kevin didn't enjoy the waffle too much though because it tasted plain to him. It also tasted plain to me also but once someone mentioned there's a hint of maple syrup or something sweet, I kinda started tasting it. It's definitely not too obvious though. So here is the part where I have no idea if I would actually get this or not. The prices here are on the higher side ranging from $8 - $15. And so I am guessing the Puff Daddy might cost around $8 too. If I am dining in I would rather get the wings for a bit more money but at least I would get more chicken for the price. The wings here are actually good, flavorful and huge and cost around $15 for 10 wings (fair price imo)! They are not the dry crispy kind though, more of the wet soggy kind that goes well with rice (or by itself if you like it like that). But if I happened to stop by and am walking around the downtown Santa Ana area, the Puff Daddy is convenient good choice! And it's just fun to eat... ! We got the Buffalo Waffles Fries with Popcorn Chicken too! These pieces were actually crispy and I like how the breading is thin. Unfortunately, as you can see from the photo below, there are barely any chicken pieces! Not sure if it's worth $8 ... but the waffle fries were crispy. Omgahhhhhh this chicken sandwich was DROOL-WORTHY! It has bacon in it too and everything about it was just right. Except for the fact that we only got 1 chicken in it instead of 2 (it's supposed to come with 2 by default), it was still so freakin` bomb! *But if you do order it, make sure they give u two pieces of chicken by default. These wings are so good and are just as good as leftovers! Very flavorful! The chicken sandwiches are actually oh so good and comes with two chicken pieces. So much flavor and each bite will leave you wanting more! I recommend the Cluckin` Good Sandwich! The menu names are so funny! Main Chicks... side chicks... LOL so punny. Overall, the food here is good but the most worth-it things are probably the wings itself and the sandwiches! The vibe at 4th street market is hipster and trendy (like adult cafeteria) and so prices tend to be on the higher side. Street parking is meter parking or park near Lacy / 4th for free no-meter parking! I think the structure parking behind the 4th Street Market is cheap too!